Look out Nermal! There's a box headed towards the United Arab Emirates with your name on it! Don't fear though, this large cat is more snarl than bite. Well, as long as you bring along lasagna. You can't go out on Halloween night if your going to continue being mean to Odie. Okay. Maybe you can go out anyway. But I'm not sure how much you're going to like it. Most people give out candy to trick-or-treaters, not lasagna. Alright, I guess you can have some lasagna with your candy, but only as long as you promise not to let Odie out! Odie was always a little dim-witted. But even if he was dumb, he was also loyal, trusting, and a good dog overall. Then Garfield had to come along and take advantage of him. Shame on you Garfield for pushing Odie off that counter so many times and trying to send him to Zimbabwe! We love Odie around here, and we hope you do too when you go in this exclusive costume! You will have to provide your own slobber, by the way. We couldn't figure out how to ship the real thing. 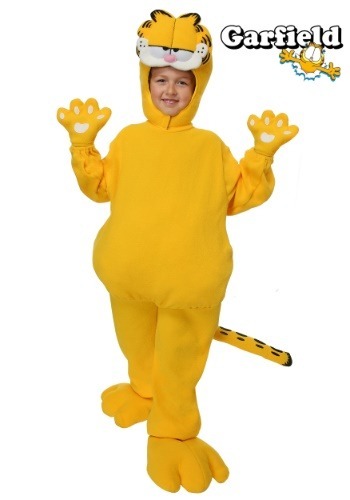 The best part about dressing up as Garfield? Free lasagna. But it also doesn't hurt to look cute and sassy while dressing up as a cute and sassy carton cat. And lasagna! Okay, okay. 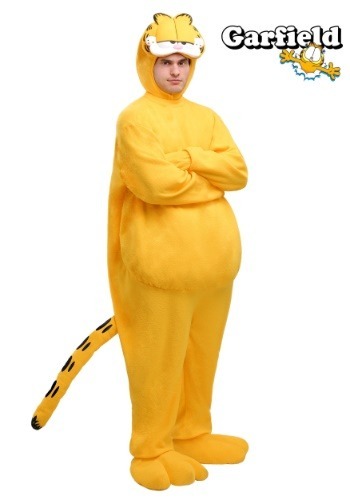 You'll break more than just Jon's heart in this Girly Garfield Costume! Man, Odie will eat anything! Look at this, he ate a whole pack of gum, a cellphone, some lint, a ticket for a half off sandwich that expired two months ago! Bad dog! Wait a minute... this is a purse in the SHAPE of Odie. Well, if that's the case he's doing a great job looking adorable and keeping your stuff handy. Good dog! The best part about dressing your toddler up as a lazy cartoon cat, is that you get a little break from the terrible twos and all its energy. 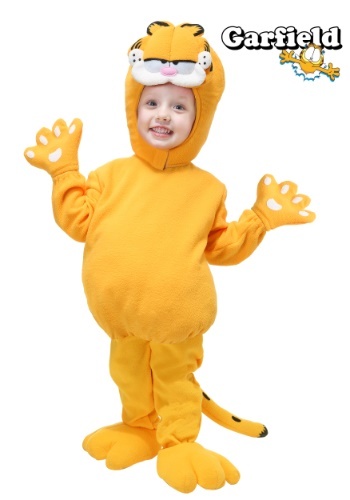 When dressed as Garfield, it will be fun to play the mimic Garfield game: sleep on the sofa, watch TV, wait around for lasagna, and play with the dog. I think your Halloween just got a lot easier!